Dispute Resolution: Master in Dispute Resolution, professional project on conflict decision-making, Marquette University. For more information on my work experience and education visit my LinkedIn profile. 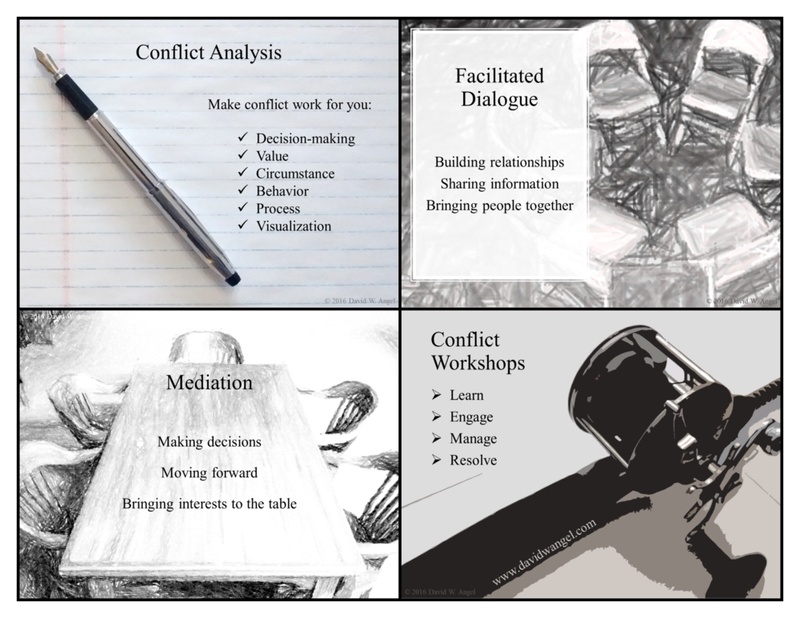 To help make conflict work for you, I focus on four primary services: Conflict Analysis, Facilitated Dialogue, Mediation, and Conflict Workshops. For an assessment of your needs and a quote, please contact me. Pro bono services are available for nonprofit and community organizations. If you are interested in pro bono services, please include a brief description of your organization and how these services can further your organization’s mission. An analysis of your conflict and your system of conflict decision-making. Great for when you need a better understanding of your conflict and ways to prevent and resolve conflict. Useful for determining how conflict helps and/or hurts your ability to achieve your goals. A neutral third party helps in private decision-making. Great for when a conflict has created an impasse and you want to retain control over reaching a mutually satisfactory outcome, but need assistance in how you reach that agreement. A neutral third party helps participants create a constructive conversation using Essential Partners’ method, Reflective Structured Dialogue. Great for information sharing and relationship building. Can be useful for laying the groundwork prior to making a decision, or for getting feedback for evaluating decisions that have already been made. Conflict workshops are great for helping individuals and organizations increase awareness about how to use conflict beneficially. This includes mitigating the negative outcomes of conflict, and increasing the positive value of conflict opportunities. Conflict workshops are tailored to your specific needs and can cover a broad range of topics, such as conflict decision-making, negotiation, difficult conversations, strategy, etc. David W. Angel conflict consulting booklet - front and back pages. Right click to "save as." David W. Angel conflict consulting booklet - inside pages. Right click to "save as." Every conflict has a story to tell. Are you telling yours? Storytelling is a tool you can use to make conflict work for you, rather than against you. If you find conflict confusing, intimidating, or difficult to handle, tell it as a story – a story that both explains your past and predicts your future. After all, conflict isn’t just about where you’ve come from, it’s about where you’re going. But a good story doesn’t just tell the facts, it explains why they are important. Conflict is about making decisions, and when you understanding what brought you to today and why it matters to you (and others), then you can make decisions about what to do next with confidence. 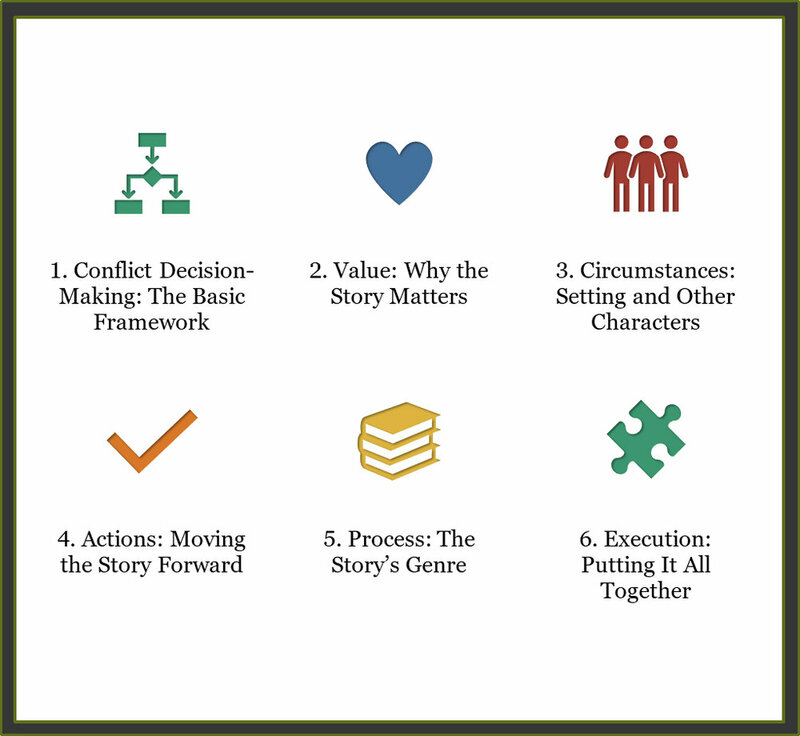 The Conflict Resolution Through Storytelling workshop is broken into six parts: 1) conflict decision-making, 2) value, 3) circumstances, 4) actions, 5) process, and 6) execution. From "Using SWOT Analysis to Tell a Compelling Story." From "Talking Politics: Moving Forward Post-Election." Here are some links to resources I find helpful. If you have any resources you'd like to recommend, contact me.